We have developed ultra-fast means of telecommunication and swankiest of electronic devices. But no matter how high-tech these gadgets are, they still rely on the humble battery for sustenance. The device has evolved much over the years. Lithium-ion batteries have replaced the basic carbon-zinc and alkaline ones, which are still used in flashlights and TV remotes. Now, a study on power storage capacity of lithium-ion battery has ensured the omni-present device would be doubly efficient in future. Slim and simply packaged, the lithium-ion battery easily slinks into the latest sleek gizmos. Its rechargeable nature has captured the hearts of consumers. According to a study by Lux, an independent research firm, the lithium-ion battery market has crossed $10 billion. However these batteries are not without disadvantages. Their high production cost and fragile technology do not make them the best bet. As electronic gadgets become increasingly high-tech, scientists scramble to create batteries that are small, inexpensive and long lasting. At present, they are trying different components to go with lithium to increase energy output and improve technology. Researchers at the Institute of Inorganic Chemistry and Empa in Switzerland have developed a nanomaterial comprising tin crystals. When incorporated in lithium-ion battery, these crystals increase its energy storage. Nano tin crystals along with carbon and binding agents act as electrodes. “This enables the battery to store double the power compared to conventional electrodes,” says Maksym V Kovalenko, co-author of the study published in Journal of the American Chemical Society on February 15, 2013. For grid scale technology, many scientists say, sodium would be the most viable solution. “Sodium is cheap and abundant,” says Reza Shahbazian-Yassar, adjunct associate professor of Materials Science and Engineering at Michigan Technological University, in the US. “It is an economically feasible technology if we tackle the technical challenges. “For grid storage, weight is not a concern and we need cheap batteries,” he says. “Batteries, more specifically lithium-ion batteries, made steady progress in terms of performance in the past 20 years. “It is time for a disruptive technology. According to Lux, next generation batteries, such as lithium-air, lithium-sulphur and zinc-air ones, could be in the market by 2024. To store renewable energy such as wind and solar, battery is not viable due to technical issues, like less storage capacity and short life span, and economic reasons. Two researchers from University of Calgary, Canada, claim to have found a simple way to store green energy. They have developed a catalyst by combining non-toxic metals, like iron, cobalt and nickel, in a highly disordered or amorphous structure. Electrolysers can use this catalyst to accelerate a chemical reaction that converts electricity from renewable energy sources into chemical energy by splitting water into hydrogen and oxygen fuels. These chemical fuels can be stored and converted to electricity whenever required. “Having cheap and efficient electro catalysts would enable homeowners and energy companies to store and reuse intermittently generated electricity such as solar and wind power,” say the scientists. The study was published online on March 28, 2013 in Science. LITHIUM-SULPHUR: This rechargeable battery is known for its high energy-storage capacity. Scientists say it may succeed the lithium-ion cell because of its efficiency and low cost. It is also lighter than lithium-ion. But its success depends on eliminating some of its technical constraints, such as short life span. A team of scientists at Fraunhofer Institute in Dresden, Germany, has developed a different version of lithium-sulphur by introducing a silicon-carbon compound into the battery system. The team claims the improved battery has increased life span. ZINC-AIR: This electro-chemical battery uses zinc along with oxygen sourced directly from air. It has high energy storage capacity and is relatively less expensive. It differs in size and ranges from small cells used in hearing aids to larger batteries used in film cameras. BIOCOMPATIBLE ZINC-AIR: The technology, commonly found in hearing aids, may soon find application in implantable medical devices. Scientists from Institute of Physical Chemistry, Poland, have developed a zinc-air battery with a biological touch. They have created an electrode with enzyme bilirubin oxidase wrapped in carbon nano tubes. This specially designed electrode is able to supply 1.6 volts power for one-and-a-half week. SODIUM-ION: It is rechargeable and uses sodium-ions to store energy. Though still in its infancy, the battery is set to replace lithium-ion battery soon due to its high efficiency and low cost. Salt power in the form of sodium is considered promising. Scientists from Tokyo University of Science in Japan have also turned to sugar to empower their sodium batteries. They found that when carbon made from sugar is used in the battery it greatly increases the battery capacity. SODIUM-AIR: It also has high energy storage capacity. Sodium is cheaper and more abundant than lithium. A study by researchers from Institute of Physical Chemistry in Germany showed that replacing lithium with sodium in metal-air battery improves rechargeability. Most lithium-air batteries have limited use because they are single-use and cannot be recharged. This is due to lithium's instability when combined with air. However, the scientists found that sodium is stable even when combined with air and, hence, can be recharged. 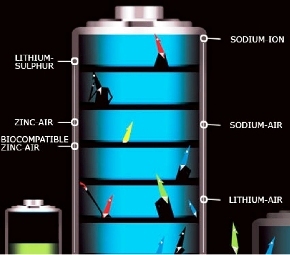 LITHIUM-AIR: It has a metal-air battery chemistry which uses oxygen present in the atmosphere for its reactions. A lithium-air battery possesses high energy storage capacity because it uses oxygen from the air instead of storing an oxidiser internally. Industry experts tout this battery as one of the prominent candidates for future high energy storage devices.